When the Dawn probe approached Ceres, it found a striking feature. Against the dim gray of the world was a small patch of brilliant white. While images showed a brilliant almost metallic gleam, that was largely due to the enhancement of the images. Things in space are typically pretty dark, and even the bright spot wasn’t that brilliant. But the extreme contrast between the white region and the surrounding terrain clearly indicated that something unusual was there. Was it water ice? A layer of salt? Or something else? It looks like we finally have the answer. A new paper in Nature studies the bright region, and finds it’s consistent with magnesium sulfates. The salt is mixed with water ice and other surface material. The presence of salt on Ceres’ surface implies that it contains briny subsurface ice. 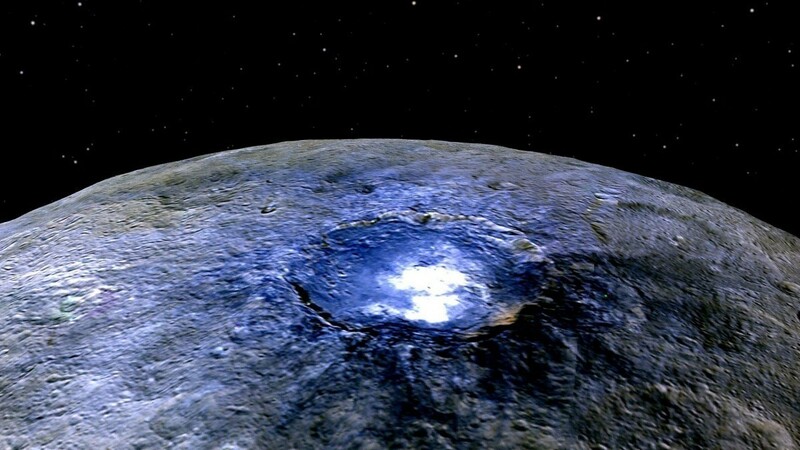 When a meteor collides with Ceres, it would expose this ice, which would sublime when exposed to sunlight. The bright spots we see would then be the salty material left behind. This new finding, combined with other research that finds ammonia on Ceres gives support to the idea that Ceres originally formed farther from the Sun that it is now. We know that the location of planets have changed over time, and the formation of water ice and ammonia typically occur beyond a distance known as the ice line, which is generally thought to have been a bit further than Ceres during the early solar system. But this is just the first of what will be a long line of papers coming from the Dawn mission. Already we’re developing a picture of Ceres as a complex and fascinating world.